Most people don't mention "Iceland" as their top number one holiday destination. However I'm a bit strange and decided to go to just this place on holiday this year. After some investigations it seemed that the best time of year was somewhere around the end of July regarding temparature, however you never know certain about what to expect. That means packing all types of clothes... summer clothes, but also a thick winter jacket, skiing clothes and rain clothes. Of course, depending on what you are going to do exactly. I wanted to see all possible types of terrain on iceland, which includes nice warm lagoons (swim wear) and glacier (warm clothes is a good idea there). Flights to Iceland are not very cheap either, but then again, nor is anything else cheap on Iceland. (Yes, the alcohol tax is even higher than in Norway). After a bit of investigation in the different points-of-interest on Iceland with the help of some locals (thanks Helgi and Bjori!) and the Lonely Planet I headed to Iceland with a friend on July 6th. After getting to Keflavik airport way to late at night we managed to find our way to the guesthouse just to find that I fluked the reservation and they they expected us to arrive the next day. That meant that we had to sleep in "sleeping bag accomodations" which was not so confortable but I really didn't care after this overly long trip. A guesthouse is normally just a small step down from a hotel usually without people cleaning up your room every day. It does however provide a good and somewhat cheaper place to stay at. The next day we toured around Reykjavik and the Reykjanes peninsula a bit and basically just waited until our room at the guest house was ready. After a well needed shower to get rid of all the smells we met up with a local and headed for a relaxing bath in the Blue Lagoon, the most famous (but definitely not the only) geothermal pool in Iceland. Helgi suggested to have dinner at ... and so we went there for a good meal. The best meat in Iceland is sheep or lamb and you figure out why once you start out driving in the country side... the only animal that you'd find there is sheep... and you find them literally everywhere - both off the road and on the roads. 930. The parliament was build on a site called Þingvellír which is now part of a national park. Besides the site of the former parliament the general landscape is also quite interesting as well as there is a massive lava ridge cutting across the landscape there as well as some water filled gorges and (ofcourse) a waterfall. From Þingvellír we avoided the ring road on the way back to Reykjavik and instead took some road closer to the south of the country. Little did we know as suddendly the road turned into a gravel road which we had to follow for the next, say, 50 kilometers. The road did however pass an interesting site with lots of water coming up from the ground in bright coloured mud pools. As proper tourists we visited two other popular sites the next day. Starting off on the southern ring road we left busy Reykjavik to visit "Geysir". Before we ended up at the geysirs we drove past the Keriđ explosion crater. We actually tried to have a look at this one the day before but our map had it in a totally wrong place, however my GPS map (!! add link) did have it correctly. (!! add stuff about this event). All that as left now is a crater which now houses a small lake in the middle. 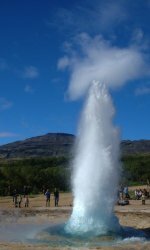 The English word geysir finds its origin in exactly the site which formerly housed this great natural water fountain in Iceland. 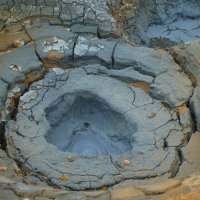 However, in the last few years the original geysir does no longer function properly and only rarely spits out its water into the air. However at the same site there is another geysir called Strokkur which still performs well. About every 5 to 10 minutes it bursts out water into the air, however each bursts intensity varies quite a bit. You need to be a bit lucky to see a "big one". Besides Strokkur there are also a number of smaller less regular geysirs and "Bluesi" - a very blue pool with warm water. From the geysir field we then proceeded towards Gullfoss - the Golden Falls - named because its always present rainbow. However... if there is no sun there won't be a rainbow either ofcourse. We were lucky and the weather was fair so we could enjoy the magic of the great falls. Leaving Reykjavik behind we set off for Höfn (pronounced like "Hùb"). Along this route there are many smaller and larger waterfalls including one of Iceland's finest called "Seljalandsfoss". We went to see a few of those and then wandered off the ring road to have a look at the Dyrhólaey plateau where there is a large colony of puffins as well. We spend some time trying to get as close to the puffins as possible for a good photo and then proceeded our route to Höfn. When driving along the southern ring road we passed lots of lava fields and glacier tongues. The glacier toungues are all part of the largest icecap of Europe: Vatnajökull. About an hour before Höfn we passed the Jökulsárlón bay which is filled with icebergs from the Breiđamerkurjökull glacier. This bay gives a very strange feeling as it looks like it just comes out of a movie. Coincidentally we figured out later that parts of a James Bond film (Die Another Day) was shot here on this bay. Höfn itself is a tiny tiny town with little to do, however we would only use it as base camp for our glacier expedition. The next morning we left early from Höfn to be on time for our 10 o'clock appointment with the Icelandic Mountain Guides. This little plan of ours almost went wrong because at the Jökulsárlón bay they where working on the bridge which set us back by about 20 minutes. We barely made it on time to the base camp of the mountain guides just to find that they had us down for 14:00 and not 10:00. Luckily there was still some space for us in the 10:00 tour. There was not much Icelandic about our guide as he was there on an exchange project from New Zealand: Ben. Ben took us out on a trip over the lower parts of the Svínafellsjökull glacier and explained us about the different things that make up a glacier. Basically a glacier is just compressed snow but because of gravity this compressed mass starts moving down the valleys until there is a point where the sun is winning from the accumulation of snow. Here the glacier melts and ends. Between the main icecap Vatnajökull and the edge are the glacier valleys and ice falls. Just after we came off the glacier it started to pour so we just drove back to Höfn and stayed in. I managed to assemble most of my panoramas and manage all my photos that I'd taken so far. Rain, rain and more rain was the case this day as well when we passed past numerous bays and inlets on the eastern side of Iceland and later through high plains with lava fields. Somewhat closer to Myvatn we made a small detour to see the Krafla region's vulcanic activity but bad wind and rain killed that plan. We did manage to have a look at the Krafla power station where electricity is won from earth heated water in the form of steam. The small tour of the plant was done by a girl who've had this summer job for the past 4 years and was happy to answer our questions, especially because were not so loud as the three tour busses that left when we just got there I suppose. We promised to come back to the Krafla area to see more of it the next day as weather was supposed to improve a lot. And indeed the weather did improve. With 18°C and sunny it was the perfect day to investigate some of the waterfalls in the area and then head back to the Krafla region. First on the menu was Gođafoss, which is situated very close to the ring road itself. From there on we went to the Ásbyrgi canyon on the north side of the road that leads to Dettifoss. The road that leads to Dettifoss is a 25 km long gravel road (doesn't matter from which end) that goes over some very intersting landscape which can only be similar to something as remote as the moon. There are actually multiple waterfalls in this river and you can get close to three without too much walking. The first one is Hafragillsfoss, which is rather uninspiring as you can see Dettifoss' spray in the background already. Dettifoss is actually quite ugly with black water but it is the most powerful waterfall in Iceland so you shouldn't really miss it. From the same carpark that serves Dettifoss it's a nice 1.5 km hike to the third waterfall that you can get to, Selfoss. After visiting those three falls we proceeded southward to end up in the Krafla region, this time with some sun. Now the rain was gone we could actually see the big Viti explosion crater and walk a bit around it. Another popular hike here is the one around Lernhjúkur that takes you through a geothermic area with lots of hot springs and the lava fields that were created with the latest erruptions in this area. You can quite clearly show where the lava came from and how it flowed. It was also clear that the area is still active as the ground was usually warm and there were lots of steam vents spraying bad smelling vapor into the air. Nearby is the Hverarönd area which also has a lot of interesting pools. 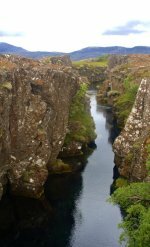 On our last day on the North side of the country we again traveled to the Myvatn area to see Dimmuborgir, the black castles. However before we went there we tried to have a look at some intersting lava pillars that can be found just inside the lake. It is quite obvious why the name of the lake is Myvatn (Mosquito lake) as the were literally swarms of mosquitoes attacking us as soon as we got out of the car. Even at the Dimmuborgir site the mosquitoes were quite persistent however not as bad as closer to the lake. Dimmuborgir has some intersting formations of lava resembling buildings and even a church. On the way back we also visited the Laufás farm museum which has some restored old homes. After Akureyri we traveled to the Snæfellsness peninsula on the west of Iceland. Unfortunately this day was again full of rain and lots of wind so we didn't really see a lot besides dirt against the car window. We stayed in a tiny town called Grundarfjórdur in a tiny but cosy hotel which also serves as the local restaurant. The town lies under the realm of Kirkufjell which we actually couldn't quite see just yet. With promises that the weather would clear up the next day we headed for bed early. At the westernern part of Iceland is the Snæfellsness peninsula with its main feature being the Snæfellsnessjökull glacier. But there are many more sites along the coast, although some of them might be a hard to get to. The Lonely Planet helped here a bit and we eventually made it to some very little traveled place: Öndsverdnes - the most western point of Europe - Very remote and actually quite boring. However when traveling further south along the coast the weather cleared and we had some nice walks along the coast near Arnarstapi where the water carved out interesting features in the rocks. The small hikes here however were the end of the holiday as we needed to head back for Reykjavik to catch the next day's early morning flight. For pictures of the whole trip, see my gallery , panoramas are here .